What a great idea! 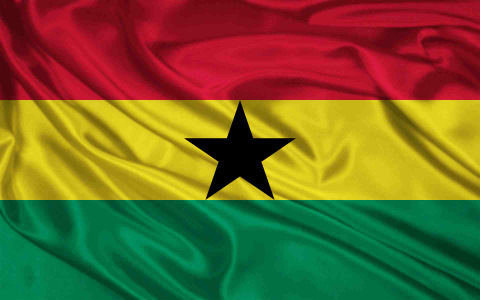 I am really interested to learn more about Ghanaian literature. Ghanaian Literature Week is back this year! This will be its 3rd rendition; I started it in 2010, ran it again in 2011, and skipped it, regrettably, in 2012. I plan on hosting the week, perhaps expanding it to a fortnight or a month, each year for as long as I actively blog. This year’s reading event is scheduled for Monday, November 11th – Sunday, November 17th. I plan on focusing on the work of Kojo Laing, a couple of poets and maybe reviewing a play. NADFLY Crockery obtained when I attended All You Need – a dinner for invited guests to explore concepts of sufficiency and rituals around food hosted by multi-disciplinary artist Nicola Atkinson (NADFLY). It was a lovely summers evening , the sun streamed into the 1873 Hall as we ate fresh veg, cheese, freshly baked bread and sipped our cold beer. As guests we were involved in excavating a hand made bowl, cup and spoon set made by Nicola enabling us to continue the experience in our own homes. We excavated the sets from two locations within wooden bases of two paintings by Victoria Evans exhibiting in the Hall providing a ritualistic atmosphere to the proceedings that evening. The aim is to meet again in a few months at Nicola’s home to discuss again over dinner our experiences using our bowl, cup and spoon at meal times. The All You Need dinner was one of the events accompanying the “Standing Stones” exhibition by Glasgow based artist Victoria Evans, her first major show. 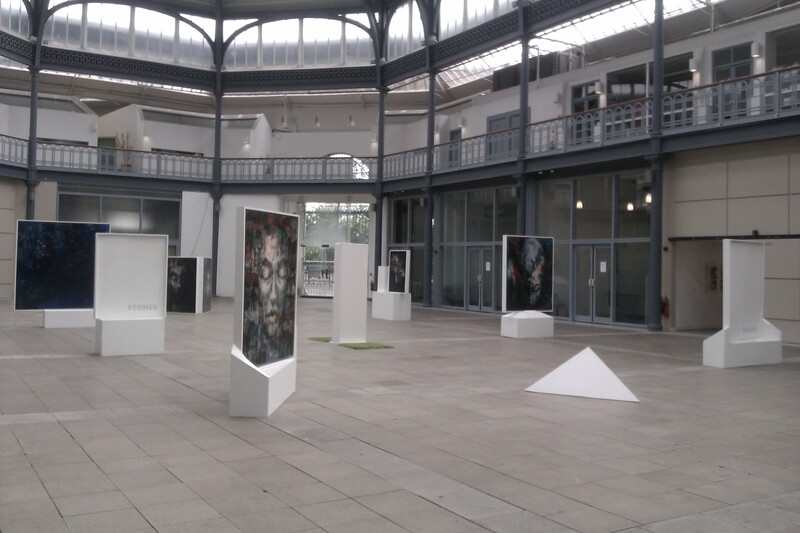 Standing Stones an installation of new large scale paintings, arranged in the manner of ancient stone monuments. Taking a process-led approach, with representation of the human face as its starting point, Victoria invites the audience to celebrate universal themes of impermanence, mortality and ritual art, and also to leave their own mark on the evolving exhibition. 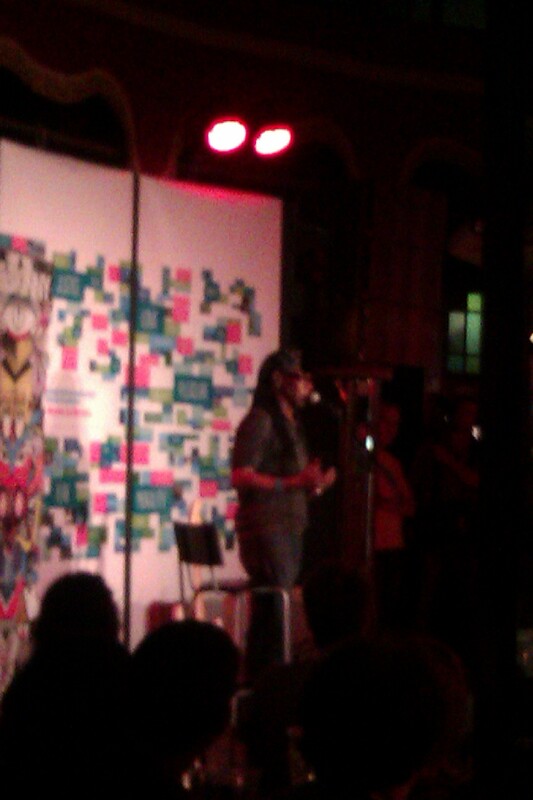 Nile Rodgers at Unbound event. Recently when watching the Grammy awards I was reminded about the time I saw music legend Nile Rodgers. It was a cloudy Saturday afternoon when I took the bus from Glasgow to Edinburgh; as I sat back in my seat I was happy to finally be on my way to getting that year’s fix of the Edinburgh Festival. My plan was to soak in the atmosphere of the arts festival I’d been coming to for the last 14 years. Over this period the journey had at times just been a brisk 20 minutes away when I lived in the city; in the last couple of years it had involved a more coordinated effort. A decent fix comes from having a place to stay overnight; knowing that where ever the festival may take you, you don’t have to worry about catching that last bus or train back. 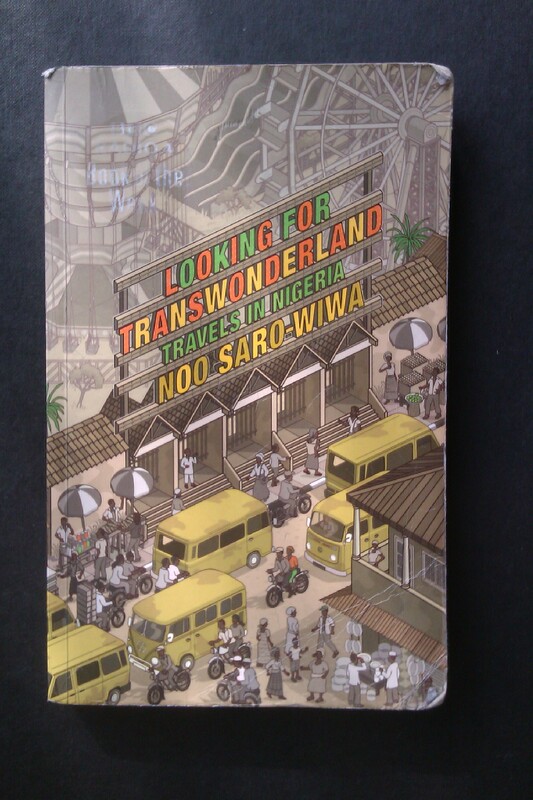 One of my main reasons for coming through that weekend was to see Noo Saro-Wiwa, an author whose travel book “Looking for Transwonderland: Travels in Nigeria” I had read earlier in the year. It’s always an added pleasure to have the opportunity to attend an event with an author whose work you have enjoyed reading. Saro-Wiwa was appearing the following morning at the Edinburgh International Book Festival. The book documents her journey on her first visit to Nigeria since the death of her father, Ken Saro-Wiwa. As you can well imagine it was a journey of mixed emotions but it’s not a sad book, there is plenty of humour and wonder as she makes her journey around Nigeria. (Ken Saro-Wiwa,) was one of the Ogoni Nine, executed by the Nigeria government, then run by a military regime in November 1995. Their crime had been to stand up for the rights of the environment and Ogoni people in the oil-producing Niger Delta. In what turned out to be his last interview, Ken Saro-Wiwa talks about the conflict, pollution and motivation for campaigning for the rights of the Ogoni people. (Channel 4 interview link). In reading “Looking for Transwonderland” I got the opportunity to catch a glimpse of the family man, who encouraged his children to appreciate Nigerian culture and explore what the country has to offer. So, I made the 50 minute journey to Edinburgh where I planned to catch up with friends and stay overnight; I left the final decision to see Saro-Wiwa until the following morning. As with most things the prices for events and travel had increased. In order to get value from my Scottish pounds during the Festival season a little cost benefit analysis came into play. My hesitation then was that since Saro-Wiwa’s book was a travel memoir, would I actually gain anything extra from attending the event? I really enjoyed the book and had found her questioning, reflective and at times comic writing style easy to read. As the bus pulled into St Andrews Square bus station I put the question mark regarding the Saro-Wiwa event to the back of my mind and stepped off the bus into the energetic and culture seeking crowds of the Edinburgh Festival. From my time as an Edinburgh resident I was aware it could take twice as long to get anywhere in the city during August. The population doubles and a wide range of street performers compete to distract you as you walk the historic city streets. I met my friends on George Street; which had been partially taken over by a Spiegeltent, just outside the Assembly rooms; it seemed to bring more of the energy of the festival to the city centre. I ate a rather nice gourmet (beef! )burger; shared potatoes wedges with my friends and soaked in the atmosphere of the early evening festival crowd. We talked about the current festival highlights and previous gems from festivals past. The plan for the evening was to go to one of the free “Unbound” evening events at the book festival, Speigeltent. That nights event featured someone called “Nile Rodgers” a musician who wrote hits for Chic, “Le Freak, (Freak out)” and worked with a wide range of artists including David Bowie, Madonna, Sister sledge and Diana Ross. It sounded interesting and we were all on board to join the queue outside the Highland Park Speigeltent. It was one of those occasions when a plan loosely thrown together for an evening really delivered. Nile Rodgers turned out to be a Disco legend; a musician, producer and co-founder of Chic, responsible for hits like, “We are family”, for Sister Sledge, “I am coming out “for Diana Ross and who also produced the albums “Let’s dance” for David Bowie and “Like a virgin” for Madonna. When he took to the stage I immediately recognised him from a TV programme I had seen a few weeks earlier about the history of disco. I’ve always enjoyed the evening events I’ve attended at the Highland Park Speigeltent. In 2006, I went to a performance poetry evening, showcasing poets Jean “Binta” Breeze, Patience Agbabi, Francesca Beard and Roger Robinson. It was an enlightening and inspiring evening. I am privileged to have been able to see such a wide range of entertaining authors and poets at the Edinburgh International Book festival over the years. The Nile Rodgers unbound evening continued my lucky streak, it was a real treat! Nile talked about the harrowing start to his very early life, the changes that lead to him becoming a successful musician and then reaching a level success that meant he was able to have complete creative control with his fellow music partners. Not only did we get a humble insight into his life journey which also included drug addition, drug rehabilitation and a battle with cancer. We also got to hear his music live in the venue. As an audience we got up on our feet and danced the evening away. The audience contained many of his fans who shouted out requests and comments which Niles’ was happy to oblige. He was at the festival to promote his memoir “Le Freak: An upside Down Story of Family, Disco and Destiny”. An audio recording is available on the festival website. As an introduction to Nile Rodgers the evening really sparked my interest. Nile Rodgers’ energy and enthusiasm for life is something that I don’t think I’ll forget for a long time. Did I make it to see Noo Saro-Wiwa? Well, that’s my next post, till then…..
Further reading and background links.